In Charlotte Smith’s biography, her sister Catherine Anne Dorset reported that “Mrs Smith left no posthumous works whatsoever. The sweepings of her closet were, without exception, committed to the flames.” Despite the family’s diligence, almost 500 of Smith’s letters survived in 22 libraries, archives, and private collections. This long-awaited definitive edition makes available most of these never-before-published letters to publishers, patrons, solicitors, relatives, and friends. As this volume was going to press, the Petworth House archives turned up 56 additional lost letters not seen in at least 100 years. Most are from Smith’s early career, along with two letters to her troublesome husband, Benjamin. The archives also preserved 50 letters by Benjamin, the only ones by him known to have survived. Two letters from Benjamin to Charlotte are reprinted in full, and generous excerpts from the rest are included in footnotes, bringing Smith’s charming, abusive, profligate husband to life. One of the most popular poets of her time, Charlotte Smith revived the sonnet form in England, influencing Wordsworth and Keats. Equally popular as a novelist, she was fundamentally a sentimental writer who wrote novels of political and social protest as well as gothic romances and experimented with the epistolary form. Her children’s books were highly regarded by her contemporaries. The letters detail one woman writer’s relations with booksellers. 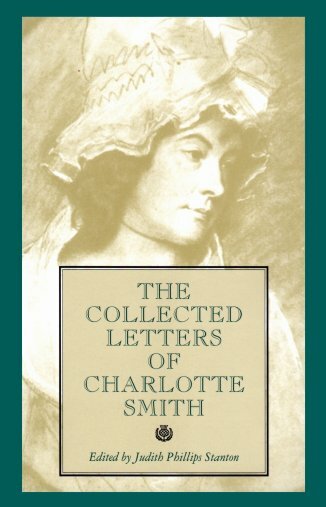 Covering Smith’s entire career from 1784 to 1806, the letters provide new details on the publication of all but two of her twenty‑two titles. All but two of her publishers are correspondents. Smith reveals her usual practices in composing, in dealing with publishers, and in experimenting with marketable genres, such as her children’s books. The letters also shed light on women and patronage in the late eighteenth century. Smith corresponds with literary supporters such as William Hayley and aristocratic patrons such as the Duchess of Devonshire and the Earl of Egremont. Smith conducted her public life in the face of profound personal troubles. With little support beyond her wits and her unwavering will, she almost single-handedly provided for a large family. The letters yield a wealth of hitherto unknown facts about her miserable failed marriage, her poor health, her poverty, and her twelve children’s lives, marriages and deaths. Finally, the letters illumine Smith’s courageous battle for legal redress in a world where women had limited rights and children had no rights at all. 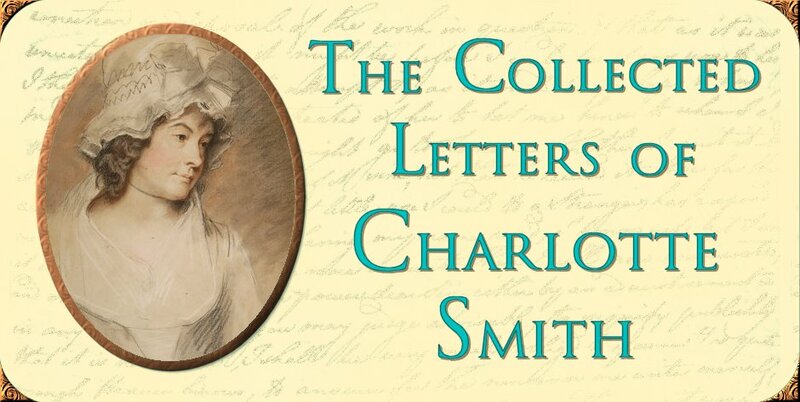 Charlotte Smith’s letters enlarge our understanding of her literary achievement, for they show the private world of spirit, determination, anger, and sorrow in which she wrote. Judith Stanton . . . deserves universal admiration for her indefatigable effort over several decades to unearth [Smith’s] letters, all the greater praise because as an independent scholar she could not depend on customary university support for her endeavor. Her presentation of the Smith correspondence is of the highest order of scholarly sophistication, at once scrupulously accurate and richly researched. And since she had no predecessor, she had to perform the preliminary labor of a biographer simply in order to ground Smith’s letters in the complex affairs of her life. This book is an excellent model of feminist scholarship about the past. It makes available for the first time about five hundred letters written by the late eighteenth-century English novelist and poet Charlotte Smith. The editor, Judith Phillips Stanton, supplies extensive notes and a biographical roster of main characters. She helps readers navigate a complex and poignant story by interleaving a chronology of Smith’s publications with dates of key events in the story of Smith’s twelve children, her marital saga, financial burdens, and legal woes. If . . . you were to read these letters for pleasure, you would hang yourself. . . . [But these letters] need to be read. Stanton has impeccably, brilliantly, assembled and edited them. With an exhaustive knowledge and understanding of her subject and her subject’s milieu, she has contrived a very important record both of the life of publishing and of the life of a woman left with eight children (four had died) not just to rear, but to establish respectably in the world. . . . And Stanton, through her preface and notes, has contrived something like a biography of a woman of genius whose work has been read but which until recently has almost inexplicably, in comparison with her peers Burney, Austen, and Edgeworth, been neglected. Smith claimed that throughout her life she lacked a champion: no one—husband, brother, bookseller—ever stepped forward in her defence. With Stanton, Charlotte Smith has finally found such a champion. Charlotte Smith was at the height of her popularity and creative powers when she wrote this unusually short letter. It touches all the bases. It shows her continual concern and often anxiety for her children’s health and well-being, and here even terror for her second daughter’s life. Under such burdens, she never shirked what she called her “literary business.” Not untypically, as she completes and corrects the final copy of Vol. 4 of The Banished Man for publication, her shrewd business sense leads her to propose a new work in a potentially lucrative form new to her, a school book for children. She went on to write six of these, along with her ten novels and six volumes of poetry, along with countless letters. The original portrait of Charlotte Smith, made in pastel crayon by George Romney in August 1792, was lost for over a century. Previously, all we had was a black-and-white photograph held by the National Portrait Gallery. They generously allowed its use for the dust jacket of my edition of Smith’s letters. The drawing miraculously survived the San Francisco earthquake and surfaced in 2005 to be donated to Abbot Hall Art Gallery in Kendal, Cumbria, a lovely little museum in the lake country about 20 miles southeast of Grasmere. In 2006, Loraine Fletcher, Smith’s biographer, and I made a pilgrimage to see it. It is amazingly expressive. I felt that I was in the room with Smith that weekend at William Hayley’s Eartham retreat when Romney drew her from life. Seen in person, the whitest chalked lines in her mobcap and the fichu around her shoulders glow. The pink blush on her cheeks is fine as china, and the sadness in her eyes brought tears to mine. The new color photograph of it, seen in this page’s banner, has been released by the Abbot Hall Art Gallery to the public domain. The handwriting in the banner’s background is a sample of Smith’s. It was bold, elegant, and outgoing, almost extroverted, and in spite of her frequently poor health and arthritic hands was remarkably clear, readable and consistent from letter to letter over the 25 years for which her letters survive. Charlotte Smith by George Romney, 1792. Wikimedia Commons. The portrait and photograph are in Public Domain. Charlotte Smith’s handwriting: Judith Phillips Stanton, The Collected Letters of Charlotte Smith. Bloomington: Indiana Univeristy Press 2003. Fig. 1, 77.